Nos. 2 to 12 Market Square are on the South side of the street from Whielden Street to The Crown Hotel and are sometimes described as 2 to 12 High Street. As can be seen in the modern photo above, all have had Georgian facades added with large sash windows on the first floors. Nos. 2-4, the building with the curved front at the junction of Market Square and Whielden Street has had many changes of use as can be seen from the photos below: from the late 19th century a shop selling all sorts of clothing, to a bank (initially the Union of London & Smith’s Bank , later the National Provincial and then NatWest) and now a jewellery workshop. No. 6 was King’s the chemist’s shop with a printing works above and a visiting dentist. It is now Seasons. It was a timber-framed building which has been re-fronted – there is a plaque on the side wall “TDTD 1805” (see photo below)), probably the date when the façade was changed by Mr Tyrrwhitt-Drake. Isabella Drake bought this property in 1734 from John Grimsdale of Bulstrode, Chalfont St Giles, yeoman. It was a single residence rented out by the Tyrwhitt-Drake family to a variety of tenants including: William Weller, brewer (1841), Mary Channer, annuitant (1851) Robert Wingrave, landed proprietor and fund holder (1861), Jane Staines, teacher (1871) and Clement Cheese solicitor in 1881 and 1891. In 1901 there were no tenants and in 1911 the tenant was Henry John Henderson, a 27 year old medical practitioner. In the 1928 auction the tenant is listed as ‘Crowhurst’. Nos 8-12 are The Red House, with two shops below and offices above. The Post Office was here until it closed in 2001 and prior to that Lyncro’s hardware shop (run by Mr Lynn and Mr Crook) was here in the 1970s and before that Mrs Hinkley’s fruiterers and florist in the 1950s. 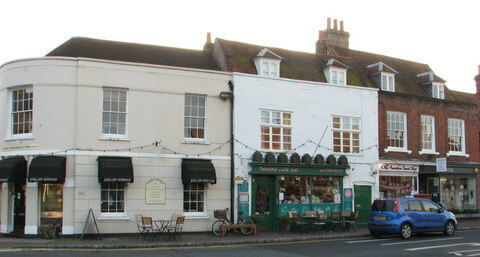 It became a popular sweet and ice-cream shop – see the photo on the Chiltern Society PhotoGroup website. It is now an estate agent. Below the photo gallery, you can find much more detail about people and dates for these houses. 1778 James Bolton of Carey Lane near Goldsmiths Hill, citizen & engraver, and his wife Elizabeth (formerly Elizabeth Phipps “cousin & devisee in will of William Phipps late of Amersham, mercer”) sold to John Godding of High Wycombe, cordwainer “All that messuage or tenement situate and being in the town of Amersham wherein the said William Phipps deceased did lately dwell and wherein Joseph Trone the elder & Joseph Trone the younger do now dwell”. 1734 Sold to Isabella Drake of Shardeloes, widow for £325 by John Grimsdale of Bulstrode, Chalfont St Giles, yeoman “All that Messuage or Tenement with the appurts wherein one William Abraham heretofore dwelt situate and being in the High Street of Amersham, and also all that Messuage or tenement with appurts wherein Samuel Birch heretofore dwelt situate and being in Amersham aforesaid in a street there called Whielden Street and also all outhouses malthouses edifices buildings barns stables yards …. which said messuages tenements and premises are now or late were in the several tenures or occupations of Joseph Brandon Paul Line the younger and John Meacock the younger”.